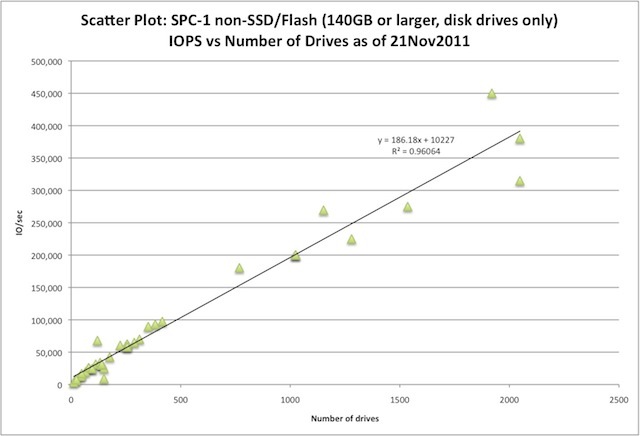 The above chart plots Storage Performance Council SPC-1 IOPS against spindle count. On this chart, we have eliminated any SSD systems, systems with drives smaller than 140 GB and any systems with multiple drive sizes. Alas, the regression coefficient (R**2) of 0.96 tells us that SPC-1 IOPS performance is mainly driven by drive count. But what’s more interesting here is that as drive counts get higher than say 1000, the variance surrounding the linear regression line widens – implying that system sophistication starts to matter more. For instance, if you look at the three systems centered around 2000 drives, they are (from lowest to highest IOPS) 4-node IBM SVC 5.1, 6-node IBM SVC 5.1 and an 8-node HP 3PAR V800 storage system. This tells us that the more processing (nodes) you throw at an IOPS workload given similar spindle counts, the more efficient it can be. The other interesting facet on this chart comes from examining the three systems centered around 250K IOPS that span from ~1150 to ~1500 drives. The 1156 drive system is the latest HDS VSP 8-VSD (virtual storage directors, or processing nodes) running with dynamically (thinly) provisioned volumes – which is the first and only SPC-1 submission using thin provisioning. The 1280 drive system is a (now HP) 3PAR T800 8-node system. The 1536 drive system is an IBM SVC 4.3 8-node storage system. One would think that thin provisioning would degrade storage performance and maybe it did but without a non-dynamically provisioned HDS VSP benchmark to compare against, it’s hard to tell. However, the fact that the HDS-VSP performed as well as the other systems did with much lower drive counts seems to tell us that thin provisioning potentially uses hard drives more efficiently than fat provisioning, the 8-VSD HDS VSP is more effective than an 8-node IBM SVC 4.3 and an 8-node (HP) 3PAR T800 systems, or perhaps some combination of these. The full SPC performance report went out to our newsletter subscriber’s last November. [The one change to this chart from the full report is the date in the chart’s title was wrong and is fixed here]. A copy of the full report will be up on the dispatches page of our website sometime this month (if all goes well). However, you can get performance information now and subscribe to future newsletters to receive these reports even earlier by just sending us an email or using the signup form above right. For a more extensive discussion of block or SAN storage performance covering SPC-1&-2 (top 30) and ESRP (top 20) results please consider purchasing our recently updated SAN Storage Buying Guide available on our website. As always, we welcome any suggestions on how to improve our analysis of SPC results or any of our other storage system performance discussions. Great post on an interesing angle to SPC-1 benchmark results. SPC-1 was designed from the outset to "avoid" cache effects by uniformly and randomly distributing the IO workload across all of the storage made available to it – what is called the "ASU" or Application Storage Unit within the SPC-1 spec. On this point I wanted to add some color if I may to your statement on the VSP being "more effective" than systems with a lower drive count. First, I do work in the HP Storage Division (APJ) in a technology evangalist role, and follow closely SPC-1 submissions etc… Hence my comments below are from that perspective! I think that the "more effective" you refer to is more likely a factor of the more current HDD technology (VSP: SFF SAS vs. T800: LFF FC) and the big difference in storage efficiency; rather than the thin provisioning potentially using hard drives more efficiently than fat provisioning. The other interesting aspect to the VSP result is why Hitachi sought to implement a relatively complicated host-based RAID-0 striping configuration. Is this saying that the virtualisation and data layout within the VSP thin-provisioning pools is not effective enough at eliminating hot-spots, and to achieve satisfactory performance one must host stripe? Host [wide] striping is overly cumbersome, and I think these days a function best left to the storage array to manage. If you understand SVC then saying "it's unlikely that the backend storage (DS4700s) at the time were thin provisioned. So it's sort of a mixture between thinly provisioned at the SVC level and not at the storage subsystem level." doesn't really make sense. That's a bit like saying the hard drives on the VSP weren't thin provisioned, only the volumes. It's hard to compare the details of the two thin provisioned results – there isn't a lot of info on the VSP's actual use of thin provisioning in the benchmark disclosure that I can see, and the benchmark seems to make heavy use of striping at the Windows HostOS layer with diskpart and dynamic disks, which I suspect most admins would be nervous about using in real life. I guess that's the nature of benchmarks. 10 years ago controllers tended to be the bottleneck but I think the industry has long since fixed that. SPC-1 seems designed to show up controller bottlenecks otherwise the drive count is the choke point..With SSDs maybe the controller choke points will return to relevance soon. It does seem to have picked up some discriminatory power at high-drive counts of late. If one looks closely, two distinct trajectories appear in the scatter plot above 500 drives. The SPC-1 has not changed – it is still cache-hostile. What I believe is likely happening is that some systems are showing signs of component (front-end, CPU, cache, drive loop,…) saturation before the HDDs get saturated. I'll need to dig deeper to determine what it is as it is architecture dependent.